Despite the large amount of the annual dividend for 2015, the future of Alaska’s small basic income is under political threats as the state suffers from a large deficit gap. Confirming earlier forecasts, the amount of Alaska’s citizens’ dividend paid this year will be the highest ever paid (without inflation) since the first payment made in 1982. Yet, perspectives for what is the closest policy to a universal basic income in the world today are not so shining. Because the Alaskan government is currently trying to cope with an historical budget deficit, various suggestions have been made on how to reduce the state’s deficit, some involving changes in the dividend mechanism, to make it less generous. The citizens’ dividend is administered by the Alaska Permanent Fund Corporation which was established in 1976 by constitutional amendment. The fund collects at least 25 percent of all the state’s mineral royalties and lease payments and invests its accumulated reserves in financial markets. The financial earnings are then distributed equally among all Alaskans as a citizens’ dividend. The amount of the dividend however is based on a five-year rolling average of the financial earnings of the fund, which therefore no longer includes the recession years post-crisis. For this reason, low oil prices have plunged Alaska into a crippling budget deficit, but it hasn’t yet affected the size of the payout. Thus, more than 644,000 Alaskan residents registered or born before December 31st 2014 will receive their dividend checks beginning on October 1st. Despite what seems to be good news, Alaska is now in a paradoxical situation where the earnings from the Permanent Fund have exceeded the earnings from Alaska oil. This paradox has recently provoked a wave of attacks against the dividend, including from Alaska’s current governor, Bill Walker (Republican). 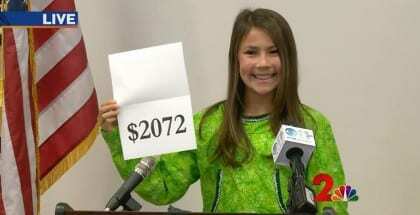 For the ceremonial announcement of the amount of the annual dividend, Walker deliberately chose to let a 12-year-old girl named Shania make the public announcement in order to send a signal that, according to him, the future of Alaska’s children are endangered by the unsustainability of the Fund. A message that was also stressed by Lt. Governor Mallott (D), and Eric Wohlforth, both former members of the Fund’s Board of Trustees, in advance of upcoming debates on how to reform the Fund. “The original purpose of the Permanent Fund was to save wealth for future generations of Alaskans. This is the people’s fund. In the months before the legislative session, groups will meet to talk about how we should manage our wealth. I urge all Alaskans to become informed investors, for their sake and for the sake of the next generation.” Eric Wohlforth said, thus making the threats against the Fund more precise than ever. If you set a but example of logic but ceasing the payment of the dividend, which can never be anything but an illogical irrational action, sending young people to school to listen to logical and rational words will be just that, just words. They won’t listen, after all their parents are not really rational people as cancelling the dividend would prove and they won’t bother being rational in the future either, regardless of how many words they listen to. For universal basic income network http://www.GRB.net.